Let me go ahead and get this out of the way: I watched Lizzy McGuire growing up. Sure, I blamed it on having a 12-year-old sister when it came out, but the real story was that there was a cute blonde girl who was my age on the TV. Of course I’m going to watch that show. That cute girl was Hilary Duff. She’s 11-months younger than me and came to fame when I was 14 years old. I’ve watched her grow up as I’ve grown up. The big difference is she’s had a ton of money and fame and I’ve had, um, not that. News broke recently that she was divorcing her husband of three years. Yesterday, I saw she was the cover girl for this month’s Cosmopolitan magazine. Talk about your whirlwind month. I don’t want to sound bitter because I’m definitely not, but I don’t know if people are meant to be together forever. Things happen over a long relationship that you can’t always fight. A marriage of 20 years, the accomplishment of that must feel really great, but there are also huge sacrifices. I just always want to fight for happiness. The irony of this statement is that there is a tease for “63 Secrets To Love That Lasts” right next to her picture on the cover of the magazine. I don’t want to be that guy who rips a celebrity for a quote in a magazine. But I do think there are two fundamental flaws in what Duff is saying in her quote. 1) When divorce is an option, someone is going to eventually take it. 2) Happiness is a feeling. Marriage is a commitment. Feelings fade. It is completely unfair to my wife for me to put my happiness solely on her shoulders. Her role as my wife is not to make me happy. Ideally happiness is by-product of our marriage, but it’s not the goal. The goal of any marriage is for each person to love, honor, respect, and sacrifice for the other. By doing that, we help each other become who God created us to be. That, in turn, frees each of us up to love ourselves in a way that leads to true joy. The only way we’re able to do that is by 100% committing to each other. Even when it’d be easier to quit and walk away. Especially when it’d be easier to quit and walk away. 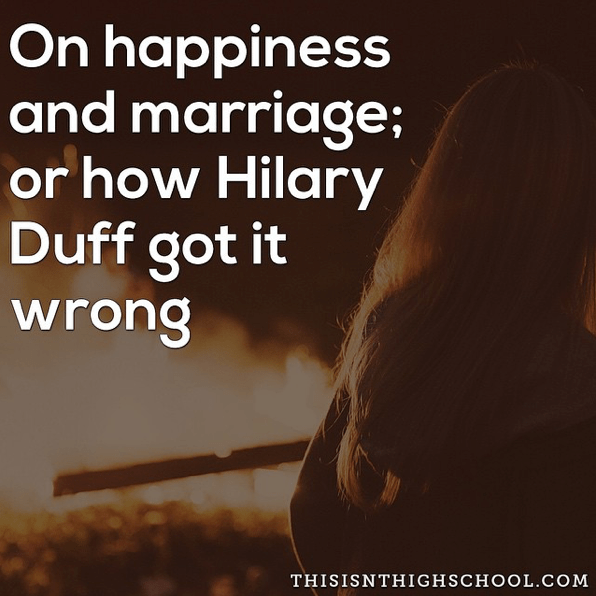 While Hilary Duff always wants to fight for happiness, our role as Christ followers is to always fight for holiness. A lot of times happiness and holiness line up together, but in the times they don’t, holiness has to win out.